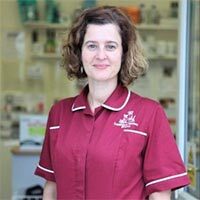 After being a Twickenham Vets client for over 10 years I finally joined the team as a part time receptionist in February 2017. My job involves meeting and greeting clients and their pets, taking phone calls and other administrative duties including updating our website and running our social media accounts. My favourite part of my job is working with our friendly team and meeting and getting to know clients and their furry friends. At home, I have a beautiful 10 year old black Labrador called Cole and would like another dog too if my husband would let me!